Very traditional, lasts a long time, can be new or historical bricks. Different patterns or "bonds" are possible. Can be used with or without mortar on a concrete or a sand base. Commonly used by do it yourselfers without mortar. Can be fairly easy to install. Moderately priced. You might want to check out our complete guide to brick patio designs. Man-made. Can sometimes look manufactured. Generally easy installation. Wide selection of colors, shapes, and sizes. Less expensive. A Natural and traditional looking patio material. Long lasting. Often expensive. Bluestone and flagstone are used frequently. The benefits of real stone, but manufactured to be lighter and less expensive. 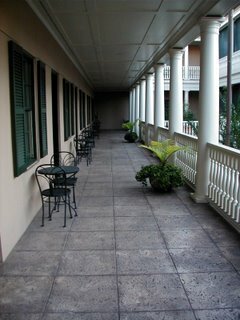 Special outdoor tiles are natural, traditional, and very well suited for outdoor patio material. Probably best to have them professionally installed. Very practical and increasingly popular. Often can be stamped or molded to look just like stone or bricks. Usually is less expensive than the actual product it is made to look like. Many colors and textures are available. You will probably need a professional with lots of experience to get a superior finished product. Probably the most affordable option. Can be surprisingly aesthetically pleasing and can be spruced up with coloring, brick borders, and landscaping. All of these are good materials to use for your patio. Of course you can use a combination of materials too. Do carefully consider the material's color. Darker means more heat absorption and warmer. Lighter means a cooler appearance, and glare can be a concern. Also, you may want to consider the drainage properties of each material. 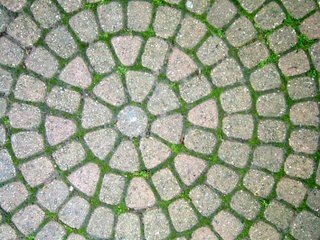 Individual stones, bricks, or pavers will let water through more than a whole slab of concrete will. While some patio materials are harder than others to install, most can be done by just about anyone who has properly researched the topic and can follow step-by-step directions. In the end, your choice of patio material comes down to whatever fits your vision of the perfect patio!